More than 3 years ago the Tiger Woods’ story was all over the mass media: he was caught cheating on his wife. Text messages, voice mails were used for communication with the mistresses. Another interesting story is connected with the head of CIA David Petraeus, his affair with the biographer Paula Broadwell was uncovered with the help of FBI. 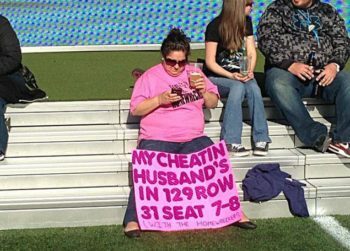 Cheating – became a common thing in the world. Beliefs and standards have changed drastically with time: for many people family has moved onto the last places in top priority list. Therefore, cheaters think that they have an “excuse” to do what they are good at. If you feel like your spouse is cheating on you – it is very doubtful that FBI or NSA will be at your service as in Petraeus’ case, but there is a great possibility of revealing the truth by thinking logically and collecting the evidence left on the mobile gadgets like cellphones, tablets. Do you notice a lot of unknown/hidden numbers in the call log on the device at unusual hours during the day or night? You can Google the location/user of the landline number, in case of mobile numbers –it is rather difficult. Chances are high that a spouse will not enter the whole name in the address book. The first name will be displayed, sometimes it’s shortened. So look for the numbers that are displayed with initials or shortened first name. Texts and messages from other Social networking apps like Skype, Viber, WhatsApp – became the most common way of communication. It includes sending love texts, therefore, spouse sometimes wants to keep a message on the phone for the delightful enjoyment while reading it on the go. Also, make sure you check the hidden files/texts, trash folders if there are any. It is a common practice to leave the texts/emails in Inbox folder for weeks till they find their place in trash bin. The same situation is with voicemail messages. Spouse might keep it to re-play it later. In most of the cases that involve cheating the existence of 2nd device often takes place. Moreover, there is an alternative SIM card that is used for communication with the mistresses from time to time. However, human factor is present always. If you notice a strange call from the unknown number and that is a spouse without a reasonable explanation – that might be the ground for becoming suspicious. Try calling the number again later for the spouse’s reaction. If you happen to find another sim card or cell phone – check it for the texts and media that are stored on it. Mobile spyware has become popular nowadays due to the multiple reasons: it is fast and easy to install on targeted device. Usually this kind of services support smartphones such as Android, Blackberry, iOS that can be easily monitored. What are the common spying features that you get with cell phone spy? First of all you have all phone call logs, location, browsing history, Address book as well as texts (even deleted ones) and many others! You get the option to record phone calls and environmental sounds to be posted with the latest details of the target device’s activities. If you are on the market for cell phone spy – try the TopSpy mobile spy app. It will take your spying experience to the whole new level!